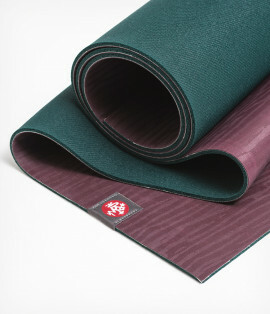 Show your passion for the planet by going with the eco-friendly eKO® Yoga Mat by Manduka®. Durable, eco-friendly composition developed for over 3 years by yoga experts. Made from natural tree rubber not harvested in the Amazon region. Creatively designed to provide unmatched combination of cushioning and grip. Closed-cell construction keeps moisture and perspiration from seeping into the mat's core. Open-cell bottom offers greater cushioning and can be used as a top surface for more grip. Heating process binds the top and bottom later together to eliminate the use of toxic glues. No PVC or toxic plastics. Care: Use Manduka® mat cleaners or a diluted organic cider vinegar wash (50/50) with damp cloth; hang to dry and do not put in washing machine. At The Yoga Warehouse we only sell the yoga props and supplies you need for your studio, fitness center or for your personal yoga routine. We invest the time and use our years of yoga experience to help you feel confident about the choices that you are making on the yoga products you or your students use everyday. To keep up with the demand that our retail and wholesale customers have come to expect at The Yoga Warehouse, we have doubled our warehouse and shipping facility to compensate for the high demand for high quality affordable yoga props and supplies.